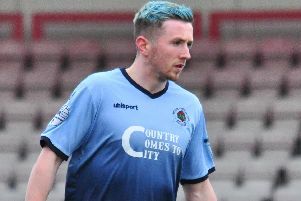 Central defender Caoimhin Bonner admits he needs to improve his discipline ahead of Institute’s return to the Danske Bank Premiership this weekend. The 25-year-old, who was sent-off once last season at Newry City, conceded that being one of the few players in the ’Stute changing room with top flight experience, he needs to remain focus ed throughout each game. “Look, I know I need to settle my head and get on the referee’s good side this season,” he admitted. Bonner feels ’Stute need to take three points from this weekend’s league opener against Newry City, at the Brandywell (KO 3pm). “We need to be taking three points, on Saturday - big time,” he said. We need to be taking three points, on Saturday, big time. “We are away to Linfield the following week and we aren’t expected to get anything so we’ll probably play with more freedom. “The Newry game is going to be tight but it’s a game we are expected to win. Then we have Linfield and then Coleraine in a few weeks later and in those big games we won’t be given a chance but against the likes of Newry we have to try and take the points. The centre-back feels ’Stute, who will be playing Irish League football in the Cityside for the first time in over four decades, need to make the Brandywell a fortress this season. “We really need to make it hard for teams when they come to the Brandywell,” he confirmed. “Teams won’t like coming here because it’s a big pitch and I think it will be a shock to a few teams how big it is. The ex-Cliftonville man feels last year’s ups and downs, both on and off the pitch, are going to help the squad this campaign. “Last season was tough for everyone, especially after the flood but all the lads stuck together and that made us a stronger team, so because of that I feel we deserve to be back in the top flight,” added Bonner.